It was a beautiful October day in San Antonio. I, of course, was sitting in a conference. I always tell myself that I will see more of the city that I am visiting, but I rarely do. The American College of Nutrition was hosting a conference on translational nutrition and I was on the edge of my seat. During this particular conference, I was looking forward to a debate about micronutrients. The symposium centered around pro/con presentations and a discussion panel regarding chromium, vitamin D, zinc, and copper.1 While the general public swoons over celebrities and athletes, I was star-struck by these researchers. Giants in the field of micronutrients and authors of hundreds of peer-reviewed papers, Dr. Ananda S. Prasad lectured on zinc while Dr. George J. Brewer presented a web of evidence pointing to inorganic copper as a possible contribution to degeneration of nervous tissue. Dr. Brewer has a particular interest in Wilson’s disease. He pointed out that a study published in the Proceedings of the National Academy of Sciences suggested that copper accumulation prevented the body (of mice) from removing a certain deleterious peptide from the brain by damaging low-density lipoprotein receptor-related protein.2 He also made the case that different reduction states of copper may have different effects on the body over the length of a lifetime which echoes some of his previously published material.3 However, that case was not made without dissent. The halls of the conference center bustled with conversation and spilled into the Riverwalk and Alamo area that evening. Could a critical mineral be dangerous? Researchers and clinicians alike were wondering. Either this convincing argument was correct or copper, which is an essential cofactor for oxidation-reduction reactions involving copper-containing oxidases,4 was a scapegoat for some other phenomena. Every nutrition student learns that copper and zinc have a competitive metabolic relationship. Could zinc or another mineral be contributing? Dr. Prasad presented and previously published that “in the developed countries nearly 30% of the elderly are zinc deficient” and that zinc deficiency or insufficiency plays a role in degenerative conditions.5 Another group reported that alterations in brain zinc status have been implicated in a wide range of neurological and degenerative phenomena.6And now we start a proverbial rabbit hole of what research says what under various conditions! 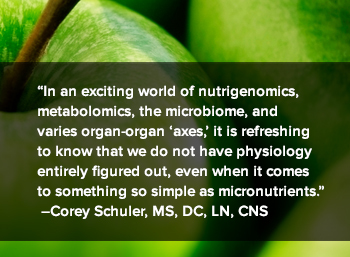 In an exciting world of nutrigenomics, metabolomics, the microbiome, and varies organ-organ “axes,” it is refreshing to know that we do not have physiology entirely figured out, even when it comes to something so simple as micronutrients. In fact, this material was revisited a year later at another translational nutrition conference in Orlando. The science continues to evolve. However, this evolving science poses a problem for clinicians who would appreciate the oxymoron of settled science. Genetic variations, also known as polymorphisms, in the ATP7B gene may modify the risk of degeneration.27 The protein, ATP7B, shuttles hepatic copper into the biliary tract. In Wilson's disease, impairment of this protein, results in excess free copper measurable in blood and accumulation in liver and brain. Being Dr. Brewer’s special interest, he was very versed in this physiology. He noted that his belief was that excess copper was the major concern for most individuals and also acknowledged the critical role of copper in human health. However, as many scientific presentations and papers conclude, more research in this area is warranted. Good dietary sources of copper include organ meats, shellfish, nuts, seeds, wheat-bran cereals, and whole-grain products.28 Those not consuming these foods may need supplementation. If a practitioner is dealing with someone who has a family history of degeneration of central nervous tissue, they may want to consider how much copper is incorporated in their supplementation plan along with dietary considerations. Dr. Corey Schuler is the Director of Clinical Affairs for Integrative Therapeutics. He is a certified nutrition specialist, licensed nutritionist, and chiropractic physician board-certified in clinical nutrition. He has earned degrees in nursing and phytotherapeutics, and has a private integrative medicine practice in Hudson, Wisconsin. Brewer GJ, Prasad AS. The 2014 American College of Nutrition micronutrient symposium summaries of the pro/con presentations on chromium, vitamin D, zinc, and copper. J Am Coll Nutr. 2015;34(2):167-74. Singh I, Sagare AP, Coma M, et al. Low levels of copper disrupt brain amyloid-β homeostasis by altering its production and clearance. Proc Natl Acad Sci U S A. 2013 Sep 3;110(36):14771-6. Brewer GJ. Copper toxicity in Alzheimer's disease: cognitive loss from ingestion of inorganic copper. J Trace Elem Med Biol. 2012 Jun;26(2-3):89-92. Prohaska JR. Impact of copper limitation on expression and function of multicopper oxidases (ferroxidases). Adv Nutr. 2011;2(2):89-95. Prasad AS. Zinc: an antioxidant and anti-inflammatory agent: role of zinc in degenerative disorders of aging. J Trace Elem Med Biol. 2014 Oct;28(4):364-71. Prakash A, Bharti K, Majeed AB. Zinc: indications in brain disorders. Fundam Clin Pharmacol. 2015 Apr;29(2):131-49. Vashchenko G, MacGillivray RT. Multi-copper oxidases and human iron metabolism. Nutrients. 2013;5(7):2289-313. Meyer LA, Durley AP, Prohaska JR, Harris ZL. Copper transport and metabolism are normal in aceruloplasminemic mice. J Biol Chem. 2001;276(39):36857-61. Harris ZL, Durley AP, Man TK, Gitlin JD. Targeted gene disruption reveals an essential role for ceruloplasmin in cellular iron efflux. Proc Natl Acad Sci U S A. 1999;96(19):10812-7. Kono S. Aceruloplasminemia. Curr Drug Targets. 2012;13(9):1190-9. Turnlund JR. Copper. In: Shils ME, Shike M, Ross AC, Caballero B, Cousins RJ, eds. Modern Nutrition in Health and Disease. 10th ed. Philadelphia: Lippincott Williams & Wilkins; 2006:286-99. Harris ED. Copper. In: O'Dell BL, Sunde RA, eds. Handbook of nutritionally essential minerals. New York: Marcel Dekker, Inc; 1997:231-73. Tumer Z. An overview and update of ATP7A mutations leading to Menkes disease and occipital horn syndrome. Hum Mutat. 2013;34(3):417-29. Harris ZL, Klomp LW, Gitlin JD. Aceruloplasminemia: an inherited neurodegenerative disease with impairment of iron homeostasis. Am J Clin Nutr. 1998;67(5 Suppl):972S-7S. Bustos RI, Jensen EL, Ruiz LM, et al. Copper deficiency alters cell bioenergetics and induces mitochondrial fusion through up-regulation of MFN2 and OPA1 in erythropoietic cells. Biochem Biophys Res Commun. 2013;437(3):426-32. Peled T, Landau E, Prus E, Treves AJ, Nagler A, Fibach E. Cellular copper content modulates differentiation and self-renewal in cultures of cord blood-derived CD34+ cells. Br J Haematol. 2002;116(3):655-61. Heresi G, Castillo-Duran C, Munoz C, Arevalo M, Schlesinger L. Phagocytosis and immunoglobulin levels in hypocupremic children. Nutr Res. 1985;5:1327-1334. Kelley DS, Daudu PA, Taylor PC, Mackey BE, Turnlund JR. Effects of low-copper diets on human immune response. Am J Clin Nutr. 1995;62(2):412-6. Hodgkinson V, Petris MJ. Copper homeostasis at the host-pathogen interface. J Biol Chem. 2012;287(17):13549-55. Eaton-Evans J, Mellwrath EM, Jackson WE, McCartney H, Strain JJ. Copper supplementation and the maintenance of bone mineral density in middle-aged women. J Trace Elem Exp Med. 1996;9:87-94. Strause L, Saltman P, Smith KT, Bracker M, Andon MB. Spinal bone loss in postmenopausal women supplemented with calcium and trace minerals. J Nutr. 1994;124(7):1060-4. Jones AA, DiSilvestro RA, Coleman M, Wagner TL. Copper supplementation of adult men: effects on blood copper enzyme activities and indicators of cardiovascular disease risk. Metabolism. 1997;46(12):1380-3. Squitti R, Polimanti R. Copper hypothesis in the missing hereditability of sporadic Alzheimer's disease: ATP7B gene as potential harbor of rare variants. J Alzheimers Dis. 2012;29(3):493-501. Food and Nutrition Board, Institute of Medicine. Copper. Dietary reference intakes for vitamin A, vitamin K, boron, chromium, copper, iodine, iron, manganese, molybdenum, nickel, silicon, vanadium, and zinc. Washington, D.C.: National Academy Press; 2001:224-57.